The online death indexes directory now has a new separate webpage for Los Angeles County, California. Los Angeles County is the most populous county in the United States with over 9.7 million residents, and includes Los Angeles, Long Beach, Glendale, Santa Clarita, Pasadena, Torrance and many other cities. There you will find listings for online death indexes, obituary indexes for the L.A. Times and other Los Angeles County newspapers, some cemetery burial indexes, and ordering information for California death certificates. While wandering around the National Archives website I came across several scanned World War I draft cards of a few famous and interesting people. I was fascinated by some of the details of the lives of these people, especially those who were not yet 20. Some were already well known. Some became famous much later. The World War I draft card for legendary "Scarface" gangster Al Capone says the 19-year-old Alphonse Capone was a paper cutter for the United Paper Box Company in Brooklyn, New York in 1918. 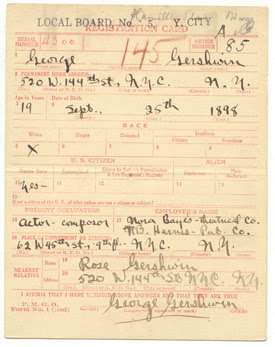 George Gerswhin's draft card, filed in New York City, gives his occupation as "actor - composor (sic)" at age 19. He would go on to write Rhapsody in Blue (1924) and Porgy and Bess (1935), among other great works. Another 19-year-old New York resident, Frederick Austerlitz Astaire, was already an actor. His place of employment in 1918 was "Winter Garden, Broadway & 50th St. NY." The Abba musical, Mamma Mia, once played at this theater. On the back of the famous dancer's draft card it says "legal name is Austerlitz but goes by name of Astaire." Fred Astaire would later star in George Gershwin's musical, Funny Face, in 1927, and the film version 30 years later with Audrey Hepburn. The 19-year-old Edward Kennedy "Duke" Ellington was a Federal government messenger in the War Dept. in Washington, DC. Unlike Gershwin, his 1918 draft card gives no indication of his future as one of the 20th Century's greatest composers. On his June 5, 1917 World War I draft card, Joseph Patrick Kennedy, age 28, lists his dependents as "wife and 2 children." His wife was Rose Elizabeth Fitzgerald (1890-1995). His children at the time were Joseph Patrick Kennedy Jr. (1915-1944), who died during World War II, and John Fitzgerald Kennedy (1917-1963), who was elected president of the United States in 1960. JFK was born just a week before his father registered for the draft. My favorite one is for master magician and escape artist Harry Houdini (1874-1926). On his 1918 draft card he put his middle name as "Handcuff," likely because he had become known as the "handcuff king."